The Seahawks brought back two of their own from 2017, RB Mike Davis, who led the team’s running backs with 240 yards, and reserve DE Marcus Smith. The Seahawks and unrestricted free agent RB Mike Davis, who led the team’s running backs in yards with 240 in 2017, Thursday agreed on a one-year contract, terms to be announced. Seattle also re-signed DE Marcus Smith, a serviceable backup who saw action in 14 games, making no starts. Smith’s deal is worth a reported $2.7 million. Davis, 25, began the off-season as a restricted free agent, but became unrestricted when Seattle did not tender him. He visited several other clubs, but returned to the Seahawks at a salary reportedly less than the $1.97 million that Seattle would have paid had it tendered him. Acquired by Seattle a year ago after he was waived by San Francisco, which selected him in the fourth round of the 2015 draft out of South Carolina, Davis spent the first 10 weeks on the practice squad before he got his chance. He started six games, his best game at Jacksonville Dec. 10, running for 66 yards. 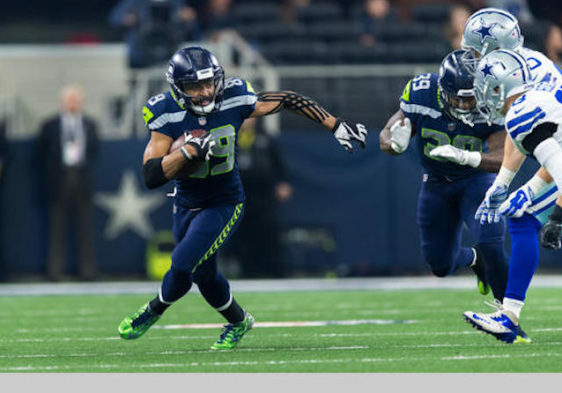 The Seahawks have effectively selected Davis over the 24-year-old Thomas Rawls, a phenomenon in 2015, who never regained his form after injuries in 2016 and 2017. He was also non-tendered and remains unsigned. Chris Carson, who played only four games before being injured, is expected to be Seattle’s No. 1 returning back when training camp begins. Smith, 25, entered the NFL as a first-round draft pick (26th overall) by the Philadelphia Eagles in 2014. He played in 51 games before signing with Seattle last year. Can someone please explain why Rawls is listed with the ‘free agents lost’ vs with the ‘remaining free agents’? Isn’t his status the same as the rest of the remaining free agents? What’s different? There were too many RB’s last season and no FB’s. Marshawn was at his best when he had Mike Robinson and Derrick Coleman blocking for him. Also last season was their first without long time RB coach Sherman Smith and yet another re-working of the O-Line. All those factors led to a perfect storm of failures for the RB position. The #1 fullback in the draft this year is Dimitri Flowers of Oklahoma , projected to go somewhere between rounds 4 thru 6 . 6’1 , 253lbs , and catches the ball well out of the backfield . I could see us using one of our four 5th round choices on him , assuming they don’t trade them in a package to try and move up into the second or third . Not sure any fullback is worth a draft choice when there will be many available undrafted. Too many other needs. If he’s anything like John L. Williams I’ll take it. I’d say it proved to be a mistake not to have FB Marcel Reese back. Willson played a little FB and H-back, but now he’s gone. Dickson has lined up as an FB on occasion. Completely agree. If they had Reese he’d at least give Russell a safety valve for when the line would break down. Also considering the youth of the RB’s and the need for motivation and dedication with Eddy Lacy Reese would have been for the backs what Baldwin is for the WR’s or Sherman was for the secondary. If the coaches stick with primarily a one-back offense this season I’ll be disappointed. Btw, Matt Tobin’s name should be deleted from the Remaining Free Agents list. He signed with New England last week.